This sequence of 14 pieces (in two books) was premiered by David Titterington at King’s College Chapel, Cambridge, on 18th November 2006, and has since been performed by other acclaimed organists, including Kevin Bowyer & Simon Nieminski. The piece itself is highly organised. Each movement is based around a key-note and these rise by a semitone between movements, giving the work some sort of harmonic progress but also mirroring Christ’s own journey. Within the movements Swayne has used a pair of eight-note modes, the first in the introduction and the second in the main body of the piece. The result could be rather dry, but certainly isn’t. You do not need to know about his construction methods, but they give the work as sense of harmonic stability whilst allowing dynamic flow and change. Swayne’s music is tonal only in the loosest possible sense of the word, but his construction techniques ensure that the harmonic movement is always away from a base, you feel that the music is coming from somewhere and going to somewhere; this is important. Stations of the Cross is a long work, some 60 minutes, far too long to be anchored in some sort of a-tonal stasis. Within each movement there is a strong sense of drama, though the result is not quite as theatrical as I expected. To describe the music as contemplative is wrong, but it is certainly thoughtful and rather austere, despite the wide tonal range and virtuoso feel. Swayne was clearly influenced both by the meditative nature of the Roman Catholic Station of the Cross, but also the highly dramatic and passionate sense of the crucifixion story itself. The work is further organised into two books, two groups of seven pieces. The second group concludes with Jesus Body is Laid in the Tomb, a full scale prelude and fugue which takes Bach and extends his structures into the 21st century, a three-part trio sonata prelude leads to a five-part fugue which concludes this amazing piece. Five pieces from Bach’s 1725 Anna Magdalena Book, reworked for the piano in a sequence of playful and brilliant variations. Technical level: Diploma. Ten pieces depicting a basket of fresh and varied vegetables, including a downcast cabbage, an elegant French bean out for a Sunday stroll, two chirpy Spanish onions, and an exploding turnip. This rewarding and picturesque collection forms an excellent introduction to the same composer’s Stamp–album GZ 002. 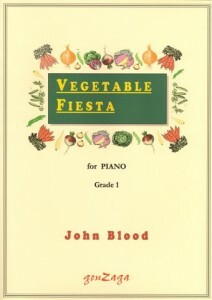 Along with the composer’s Stamp-Album, Vegetable Fiesta was chosen as a set work and performed at the 2012 Contemporary Keyboard Weekend at the Conservatoire Frédéric Chopin, Paris. Commissioned by the British Music Society. 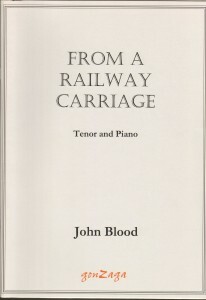 1st performed 23rd Feb. 1980 by Edwin Rolles (tenor) and John Blood (piano) at Goldsmiths’ College, London. A delightful sequence of songs vividly evoking the joys and sorrows of railway travel. GZ022 is an arrangement of the same work for tenor, piano and wind quintet. Commissioned by Jack and Linda Hoeschler of St. Paul, Minnesota for the Choir of Clare College, Cambridge. First performed on 24th September 2010 at the University of St. Thomas in St. Paul, Minnesota by the choir of Clare College, Cambridge under Timothy Brown, with Nicholas Mogg (flute). A companion piece for Hubbub, this second setting of a poem by Kevin Crossley-Holland celebrates the need for calm contemplative moments of the spirit.